​"As an instructor, Meagan is your best friend! First she beautifully describes and markets your workshop so that participants come feeling confident and reassured that they are in good hands and that they know what to expect. Then, she works with you, listening to your ideas and needs, to guarantee your success. 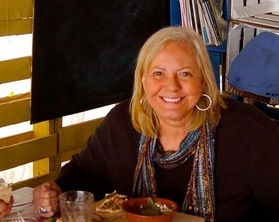 Meagan has a wealth of knowledge and experience in these beautiful places in Mexico where you will teach. Her behind the scenes work to find the right environment for each event is invaluable. All of this results in a very supportive experience for the instructor! "Meagan is an absolute joy to work with. I love teaching workshops through Art Leap Adventures because I know the details of the behind-the-scenes logistics will be seamlessly handled allowing me the freedom to focus solely on the students! Participants arrive with an upbeat attitude ready to dive into the sessions because the communications from ALA is thorough and well timed." ​"When Meagan invited me to teach my sketching Fast & Loose techniques in Mexico City, I leaped at the chance. I’m always delighted to see (and sketch) a new location, and Meagan’s skills at managing our small group made for a very successful art adventure. Her attention to detail is awe-inspiring, and yet there was also creative flexibility built into our itinerary. She chose excellent accommodations and locations for sketching, as well as exciting art exhibits to round out our experience of this great city. 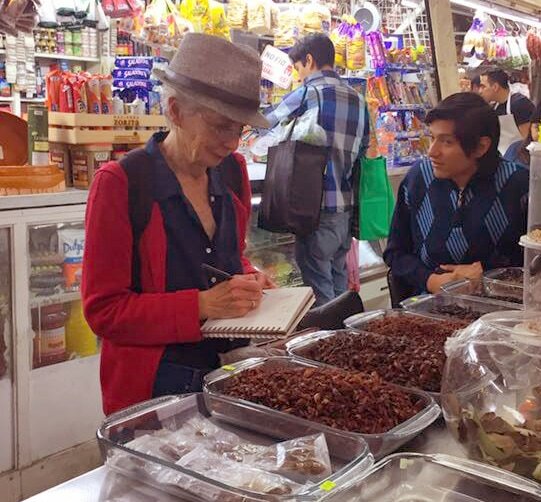 ​"When Meagan Burns learned that I was headed to San Miguel de Allende for some sketching and inspiration, she lost no time getting in touch and arranging for me to teach my “Sketching the Energy of Places” workshop there. Working with Meagan was a true pleasure; she led the marketing (which was top shelf), recruited and registered participants, and arranged the logistics beautifully, down to the last detail, leaving me to focus fully on content and teaching. The workshop participants were fantastic, up for anything, with a group dynamic that made teaching easy and fun. The workshop venues Meagan arranged were perfect for our needs; even the weather was spectacular (thanks Meagan). Laurie Richards is an extraordinary teacher. This was the third workshop I have taken from her and I continue to learn many new things. She has dedicated herself to expanding her knowledge of watercolor techniques for sketchers and has the gift for imparting it to her students. Her lessons involve examples, demonstrations and clear cut exercises that are extremely effective. She hones her lessons constantly so that all is fresh and new. It is not rare to find a talented artist teaching but it is rare to find a talented artist who is equally talented at teaching. She approaches all with an upbeat, attentive and patient nature that offers each individual a safe space to grow. Meagan Burns is the organizational wizard behind Art Leap Adventures. All the logistics are well thought out and the group is always led in a caring, informative manner. All communications and procedures are clear, timely and thorough. As an talented sketcher, she often participates in workshops but if she is not participating, she is there to see that all goes smoothly. She is very well suited to lead and traveling with her is a joy. I look forward to more adventures with Meagan and Art Leap Adventures. Laurie is so accomplished at exactly what is advertised: drama in sketching and watercolour. She is that rare person who can not only do it but teach it! She is very careful to move at the speed of her students, breaking the work into very manageable steps so everyone can gain competence in each part of what she is leading us to. She understands from the learners point of view not just the masters. And Meagan is the consummate organizer enthusiastically ensuring all is anticipated ready and looked after. It’s the complete experience! Laurie is an excellent instructor with not only her to painting skills but the ability to give positive critique feedback (even when I didn’t think it was that great 梁, but it’s a great motivator. ) Thank you Meghan for organizing. I also appreciated the group helping me with my mobility, or lack thereof. Thank you all! This workshop was well planned and organized, not only with the classes themselves but the locations, lunches and after discussions. Laurie is both a gifted artist and instructor. I learned so much from her and all the others in the class under her expert and kind guidance. I've come away with new tools and inspiration to carry on with regular art making. Thanks to Meagan and Laurie for a wonderful three days. "The thing I loved most about paper mache with Marti and Artleap was just how much fun it was to create something. No expectations, just enjoying the process. I showed my creation to friends and now a group of us, including my husband and me again, are taking the class!" "Marti encouraged me to have fun and be playful -- that's just what I needed! She is a GREAT teacher." "I had so much fun! My paper mache animal surprised and delighted me -- thank you Marti!" "You can't go wrong with Marti as a wonderful teacher -- SO FUN!!" "This workshops with Marti and Art Leap Adventures was FUN. The class was well organized, Marti is an amazingly creative and knowledgeable instructor, and both Marti and Meagan are fun to be with. I left class with a huge smile on my face, and excited to take the next Level 2 paper mache with them." "This was my first art experience since kindergarten -- it was SO LIBERATING!" "Extremely well-organized to let out creativity flow, and excellent instruction!" "I came to be inspired and have instead been more than fulfilled, I have loved taking both the Level 1 and 2 workshops!" "It was such a marvelous week—great lessons from Laurie making us stretch to learn new techniques to improve our sketching, Meagan’s always amazing arrangements so that everything goes smooth as silk, and Hugo’s can’t-be-beat hospitality making us feel so welcome. The weather cooperated beautifully, too. Another successful course for the books!" "The Laurie Richards workshop was just great!!! I learned so much, and my watercolors look dramatically different than they ever did before. Laurie is a wonderful teacher, alive with suggestions which were always of great benefit. The workshop itself was wonderfully planned by Meagan of Art Leap Adventures, with the perfect amounts of teaching time and sketching time and down time. The location in which we stayed, Alma del Sol, is right in the center of Guanajuato near everything, and is very comfortable; Hugo, the host, took great care of all of us. I would follow Meagan anywhere." "What an adventure in Guanajuato. The workshop was beautifully executed by Meagan and Art Leap Adventures. The accommodations at Alma Del Sol were very comfortable and the food was delicious. Meagan kept us on track with fun activities as well as our watercolor workshop. Laurie was an excellent teacher, one of the best I’ve had. She was prepared and well organized. She took us all to greater skill levels in our watercolors. I highly recommend this workshop, and I look forward to perhaps attending another one." "The “Dramatically Improve Your Watercolor Sketching” workshop with Laurie Richards in Guanajuato certainly lived up to its title. Laurie is a gifted, giving teacher who provided detailed written information, well planned lessons, demos and challenging exercises. The class was geared for intermediate and above students requiring some extensive planning which was definitely accomplished by Laurie. I gained as much as I hoped for and more from the workshop. The excellence of the teaching was matched by the perfectly organized and enthusiastic efforts of our leader, Meagan Burns. To top it off, we were situated in an ideal setting in the charming B&B of Hugo Anaya, Alma del Sol. Everything was first rate and I would repeat this or attend any of Art Leap Adventures trips." "Meagan really knows how to put it all together! She’s a fantastic leader who tackled Mexico City with a group of 8 like a pro. Meagan, I think you a born to this with your unflagging energy and enthusiasm. You handled the details with efficiency and attention allowing us to all enjoy a great workshop experience in CDMX. I look forward to my next Art Leap Adventure." I've been on several trips with Meagan Burns and Rhoda Draws and I always have a great time -- I can't wait until we go on our next trip together! Meagan is an excellent trip organizer and always selects the most beautiful and interesting locations to visit. Our whole group particularly loved the exhibit of Leonora Carrington paintings at the museum of modern art. I loved the location of the hotel we stayed at, which was in the Roma district of Mexico City. Meagan has a great sense of humor and is a lot of fun to be around. On this trip, I think I finally was able to better understand how to do the "fast and loose" sketching style. I was pleased with several of my drawings and displayed them proudly on social media. Meagan did an impressive job of showing us around the colonias of Roma, Condesa, Coyoacan, etc. I know you worked very hard preparing for that. I also liked your enthusiasm and energy. I admire your drawing - very creative, especially with composition and subject matter ( I liked the one with your hand, wineglass, etc.). Thank you for giving us this wonderful opportunity! What a delightful weekend… well planned, relaxing, good company, visually exciting, memorable; I always look forward to your trips and catching up on what a happy adventure your life is. Many thanks for all the care and effort you put into this weekend. I enjoyed it immensely. Meagan is a pro at organizing the most unique, interesting and fun sketching adventures. We spent two nights and three days eating delicious traditional organic meals that Meagan planned, sketching not only cows and adorable calves but also the gorgeous ranch scenery. Meagan attends to every detail with taste and aplomb - making her art adventure absolutely perfect - and so much fun! Thanks Meagan for an outing that was amazing in all ways; educational, artistic, cultural, and gastronomical! It was great to relax and sketch with a wonderful group of artists in such an awe inspiring setting. Every part of this wonderful trip went off without a hitch due to your thoughtful planning and delightful exuberance. Thank you again. I look forward to traveling with Art Leap Adventures in the future. This was a totally relaxing weekend, in such a beautiful place! It was so good to get out of the city and be in bountiful nature. Meagan as usual had perfectly planned all the details, while leaving space for unexpected pleasures. The accommodations were comfortable, the food was fresh and delicious, and the spots which Meagan had chosen for us to sketch were exquisite and inspiring. The company was also great. So was the horseback ride (though I'll want a pillow next time!). I can hardly wait for the next Art Leap Adventure! This was my second trip with Art Leap Adventures, and It always exceeds my expectations. Meagan is a great organizer and tour leader, flexible, plus just fun to be with. I'm looking forward to my next Art Leap Adventure! What a fun time in Mexico City and all made possible by you!! I so appreciate your planning and organizational skills that resulted in a “taste” of Mexico City that was diverse, safe and fun. Your high energy, flexibility, good humor and sense of adventure made the trip a good experience for a diverse group of travelers. Some highlights for me were the exhibit at Belles Artes, the Diego Rivera murals, and the time with the Urban Sketchers of Mexico. It worked for me to have time to plan for my own interests and I found the various museums that I visited, usually with Judy, worth the effort. The hotel was a good choice as were all the restaurants. Well done! Absolutely loved it! Just the right blend of tips and tricks with lots of wonderful food, fellowship, Patzcuaro sights with a charming hotel and most importantly inspiration! Great group to share sketching time with and Susan and Meagan were the best! ​It was a fantastic experience. The level of instruction was perfect and well adapted to each participant. Accommodations were outstanding with superb service. Each aspect of the workshop was well organized, but allowed for flexibility as well. Thank you for an amazing time. 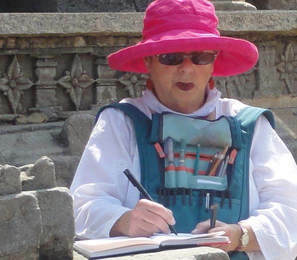 I enjoyed very much the Patzcuaro sketching trip. Meagan Burns was a superb organizer and we lacked for nothing--we had good food, a great hotel, a wonderful trip on Lake Patzcuaro, and just the right amount of teaching from Susan Dorf and enough time for sharing our work. I would follow Meagan anywhere! ​For a person who loves to sketch, this workshop was absolutely the perfect venue for an unlimited variety of sketching options (people, colonial buildings, lake, mountains, traditional festivities, lovely patios and plazas, etc). Instruction was on-going, both at the hotel and on-site. The camaraderie was supportive and lighthearted. I had loads of fun while honing my skills. My opinion is that it was a perfect sketching workshop. Sketching in Patzcuaro with a wonderfully supportive and engaged group was a delight. Susan provided a lot of information and guidance, our one-on-one moments were particularly helpful. Everyone was positive and enthusiastic. Also, the Casa Encantada was extremely friendly, comfortable and lovely. All in all, it was a very special time and I hope to do it again. ​The trip to Patzcuaro was the perfect workshop! I was impressed with the level of organization by Meagan Burns, which made the venture so easy, and also the artistic guidance by Susan Dorf. The lodging was beautiful, the restaurants researched, all I had to do was paint with my wonderful fellow travelers. I'm looking forward to future trips with Art Leap Adventures! ​We had a fabulous art workshop in Guanajuato because of Meagan Burns' terrific organization and fun, enthusiastic attitude. 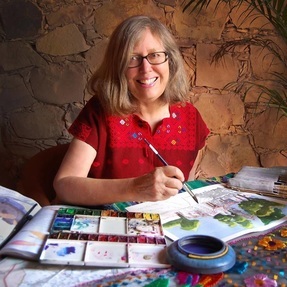 She arranged for San Miguel de Allende artist, Susan Dorf, to teach the workshop. Meagan selected a most charming well-located B&B for our lodging, and interesting restaurants for terrific lunches and dinners. Every detail was taken care of - all we had to do was bring our art supplies and enjoy Susan Dorf's excellent instruction. It was a perfect art-filled weekend​. Highly recommended! I took this wonderful urban sketching workshop last weekend. Well organized by Meagan Burns and Art Leap Adventures, taught by Susan Dorf. So much fun to be in Guanajuato and stay at the beautiful Alma de Sol B&B, with a great group of women, fabulous food and a perfect Centro location! ​This weekend with Meagan and Susan was a real treat. Meagan is the consummate organizer and made the whole stay fluid and flawless. Hugo's accommodations and generosity were wonderful. Spending the afternoons quietly sketching in small parks and plazas was a real pleasure. Susan was inspirational and motivational. Treat yourself to an art mini vacation! Meagan runs a wonderful art/adventure trip. Everything was planned and very well organized for maximum fun and sketching and comfort. Susan’s instructions were right on, even though the abilities of the group were varied. Everyone seemed to learn and shared and supported each other. Hugo, at Alma del Sol, was a welcoming host in a charming, colorful house well located in Centro. I will definitely travel with Meagan again and can’t wait to find out when and where the next adventure will be. ​I totally enjoyed the Sketching Guanajuato workshop. Meagan arranged it ALL (so happy not to have to arrange anything!). The B&B, Alma del Sol Bed & Breakfast Inn, was centrally located, near to everything, totally comfortable with beautiful rooms and colors and great breakfasts. The workshop leader, Susan Dorf, gave us some interesting lessons and some good suggestions to help our work improve. We had a short lesson in printmaking from Hugo, the B&B's owner, and made some beautiful books in which to sketch. The sites that both Susan and Meagan picked for sketching were interesting. I would definitely attend one of their workshops again! As an arts instructor, working with Meagan was a pleasure. Her attention to detail and familiarity with our location (including the best painting sites, museums, restaurants and hidden local coffee houses) helped me to focus on teaching. She is skilled at keeping the creative energy of the group flowing, and her adventurous spirit is an inspiration to be around. Highly recommended! I took this wonderful monoprint workshop last weekend. Well organized by Meagan Burns and Art Leap Adventures, taught by Hugo Anaya. So much fun to be in Guanajuato and stay at the beautiful Alma de Sol B&B, with a great group of women, fabulous food and a perfect Centro location! My recent adventure with Art Leap Adventures was beyond super. I am a professional artist and have attended many workshops. This was by and far one of the best I have attended. The entire weekend was a treat, great food, great B&B and a great printmaking instructor. Meagan makes the workshop amazingly fun!!! I am hoping to attend another workshop in the future. 'Printmaking in Guanajuato', with Meagan Burns, was a wonderful weekend art experience. It provided the perfect opportunity to explore the beautiful, lively city of Guanajuato. Our small hotel, in the heart of the historic Centro, was fabulous! Amazing breakfasts and lovely happy hours are served on the roof ...views are spectacular! In the art studio, Hugo Anaya shared ideas & techniques, making hands-on studio time, informative and a lot of fun. I highly recommend this workshop for creative inspiration, adventure and the opportunity to make new friends! Also highly recommend!! It was a blast learning about printmaking and letting go of my fear of making a complete idiot of myself!! I came away with something I am actually proud of!! Hugo is very patient and a wonderful teacher. Meagan outdid herself putting this event together with a great group of women, fabulous place to stay, not to mention the wonderful city of Guanajuato. Lots to do & explore both in and out of the workshop!! Cheers! !